Yoo-Hoo Chocolate Drink.Good source of vitamins & minerals.Shake it! Blue Diamond Vanilla Almonds Breeze AlmondMilk.All natural.80 calories.Per serving.Half gallon (1.89L). Vitamin D added. Ultra-pasteurized. USDA Organic. Our farms produced this milk without antibiotics, added hormones, pesticides or cloning. Nurturing an organic generation. At Horizon Organic, we believe that organic is a healthier choice for all of us. And lately, that idea is really catching on. More and more, our kids are drinking organic milk produced without antibiotics, added hormones, pesticides or cloning. They're also learning about the positive impact organic food has on the environment. The wholesome nutrition of Horizon Organic milk is a simple way to help kids flourish. Shelf Stable Milk. Vitamin D. Grade A UHT. What is UHT Milk? UHT shelf-stable milk is 100% real cow's milk that is Ultra Pasteurized and packaged in the Tetra Pak container designed to keep the milk pure and safe. The Tetra Pak container protects the milk from any external contamination. This is made possible thanks to its innovative six layered, airtight sealed package. The result is a wholesome milk that can last at room temperature up to six months. Once opened, it has to be refrigerated and consumed within 7 days. Now you know why UHT shelf-stable milk is the best choice for your everyday use at home or away. Just chill and enjoy! UHT shelf-stable milk has advantages, see how they can work for you! Taste: As wholesome as you want milk to be! Wellness: UHT shelf-stable milk contains the essential nutrients our body needs everyday, such as Calcium, vitamins, minerals and proteins. Vitamin D. Ultra-pasteurized. Grade A. Since 1934. Customer requested - easy to open. Convenient spout. A natural choice for those sensitive to cow's milk and/or soy products. Delicious, creamy taste! Easy to digest. High in calcium; low in sodium. Goats are not treated with growth hormones. 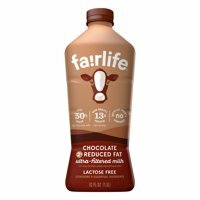 fairlife fat-free ultra-filtered milk has 50% more protein, 30% more calcium and 50% less sugar than typically found in milk. With its rich and creamy flavor, some people even say it tastes like low fat milk! Treat yourself to goodness. Always creamy rich taste. An excellent source of bone-building calcium and Vitamin D. A good source of muscle-growing protein. **This Item Is Not Refrigerated**Rich in calcium & vitamin D. Good source of vitamins & minerals. 10 boxes! Shake it! 99% fat free & 99% caffeine free. Ore Ida Bagel Bites Three Cheese Mini Bagels. Made with.8g whole grain per serving.Real cheese.7g protein per serving.Real.With mozzarella, cheddar, monterey jack cheeses and tomato sauce.9 mini bagels.$5 in savings!See inside for details. Gatorade Fruit Punch Thirst Quencher.G.Natural flavor.80 calories per bottle. Peanuts, Raisins, M&M's Milk Chocolate Candies, Almonds, and Cashews.12- 2.75oz snack packs. Enjoy premium sliced ham at home with Hillshire Farm Ultra Thin Sliced Lunchmeat. Made with perfectly seasoned, slow smoked ham and no artificial flavors, our Smoked Ham is juicy, flavorful, and 97% fat-free. Fully cooked and ready-to-eat, simply serve with mild cheddar cheese, sliced red onion and spinach on whole wheat bread for a delicious deli-style sandwich. Pepperidge Farm Goldfish Xtra cheddar.Baked snack crackers. QuestBar Protein Bar White Chocolate Raspberry.Gluten free.No sugar added.20g Protein.Only 2g Sugar.14g Fiber.6g Net Carbs. Sweet Baby Ray's Original Beef Jerky.Gourmet sauces.Good source of protein. 0g trans fat per serving.Sweet Baby Ray's, The Sauce Is The Boss!, squeezable, award wining, barbecue sauce.Bridgford.U.S. inspected and passed by Department of Agriculture.Resealable bag. Fresh from Lance's bakery to your pantry, Lance Nekot Real Peanut Butter Sandwich Cookies are a snack the entire family will enjoy. Lance Nekot Cookies combine real peanut butter with two crispy, baked cookies that fill you up and keep you going. Oscar Mayer Selects Natural Turkey Franks.Inspected for wholesomeness by U.S. department of agriculture.No artificial preservatives. *See back panel for ingredients used to preserve quality.Turkey hardwood smoked uncured turkey franks.No nitrates or nitrites added except those naturally occuring in celery juice.Not preserved.No artificial flavors, colors or by-products. Lipton® Natural Lemon Sugar Sweetened Iced Tea Mix.New look.Same great taste.Made from real tea leaves.Natural lemon flavor.Makes 28 quarts. Earth's Best Organic Stage 2 Sweet Potatoes.USDA organic. Kim Crawford Sauvignon Blanc 2013.Marlborough. Chobani Black Cherry Greek Non-Fat Yogurt.Only natural ingredients.Fruit on the bottom. Service was great! will definitely be using this service when i go back to Disney World! !